If you would like to mix your own e-liquid, this kit has everything you need to make 120ml at a strength of 6mg. The kit contains all the individual ingredients required including four 18mg nicotine shots, propylene glycol, vegetable glycerine, two Vapable flavour concentrates, four 30ml Unicorn bottles and all the accessories you will need. If you would like to mix your own e-liquid, this DIY E Liquid Mixing Kit (6mg) has everything you need to make 120ml at a strength of 6mg. A good starting percentage for our Vapable concentrates is 15%. In a 30ml bottle this equates to 4.5ml of flavouring per 30ml mix. This can be adjusted according to taste. All our concentrates are Propylene Glycol based, so the percentage of flavouring will make up part of the overall PG percentage. The nicotine solution provided is 18mg and needs to be diluted to achieve the desired 6mg strength. This means the overall percentage of nicotine required in the mix will be 33.3% or one third. In a 30ml bottle this equates to 10ml of Nicotine Shot. 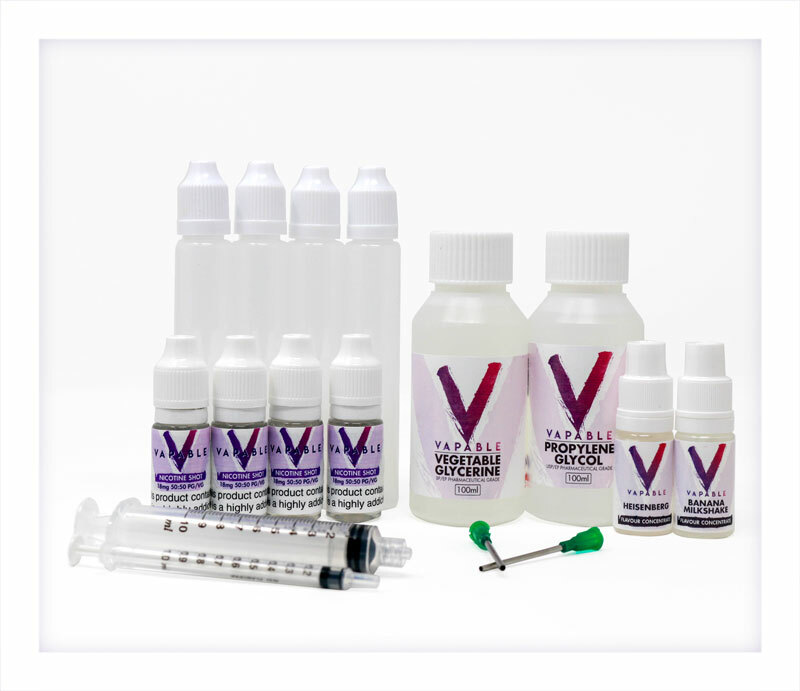 The base liquid for the nicotine shot is 100% VG. Add 8ml of VG & 7.5 of PG, place the spout and lid onto your bottle, shake until all the ingredients are thoroughly mixed and its ready to vape. great little kit to start with before moving on to bigger batches and more complex recipes. you'll never look back. Hi Using the 50/50 nicotine and aiming for 6mg, as long as you use one nicotine shot and 15% flavour (4.5ml) per 30ml, all you would then need to add is VG to achieve around 70% VG. If you went for 20% flavour, one nic shot and the rest VG, it would be around 65/35 VG/PG. If you have any problems or questions, give us a ring. Wow wow and wow. I'm new to vaping and found myself going through liquids quickly because I enjoyed the flavours so much. I researched into diy ejuice but found on other sides it wasn't in my price budget. I found this kit through onlin reviews on the best prices. I was worried it wouldn't come out how I wanted to but the recipe you have given works perfectly for me. I had only let the juice steep for a day but I got to excited and wanted to test it out. I was so surprised to find how enjoyable the juice was after just one day of steeping!! Best value for money and best products sent with the kit. I'm using strawberry and kiwi but already can't wait to make up more ejuice with apple and pinkman concentrates! Great kit and a good place to start mixing your own…. great little kit to start with before moving on to bigger batches and more complex recipes. you’ll never look back. Hey guys i bought this kit came next day! Using the 50/50 nicotine and aiming for 6mg, as long as you use one nicotine shot and 15% flavour (4.5ml) per 30ml, all you would then need to add is VG to achieve around 70% VG. If you went for 20% flavour, one nic shot and the rest VG, it would be around 65/35 VG/PG. If you have any problems or questions, give us a ring. Wow wow and wow. I’m new to vaping and found myself going through liquids quickly because I enjoyed the flavours so much. I researched into diy ejuice but found on other sides it wasn’t in my price budget. I found this kit through onlin reviews on the best prices. I was worried it wouldn’t come out how I wanted to but the recipe you have given works perfectly for me. I had only let the juice steep for a day but I got to excited and wanted to test it out. I was so surprised to find how enjoyable the juice was after just one day of steeping!! Best value for money and best products sent with the kit. I’m using strawberry and kiwi but already can’t wait to make up more ejuice with apple and pinkman concentrates! This kit was my entry into DIY e-liquids and I’m now hooked! 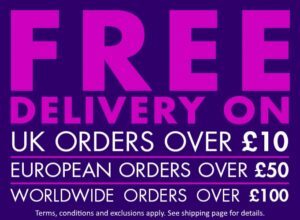 Superb value for money and incredibly fast delivery. My first attempts were pretty harsh as I used too much concentrate (after steeping they now seem much more mellow) but a second attempt reducing the percentages made all the difference. I have since ordered several more flavours in multi orders. Every one arrived the very next day and all were beautifully packaged. Vapable rocks! It tastes like apple – love it! Awful, I just brought it and made it up. its so harsh I cannot vape it. Gutted waste of money. Connor – please give us a call and talk through your recipe. We may be able to help. Quick delivery. Products were well packaged and for a first timer I followed recipe guidelines, which was really easy to follow. Flavours now steeping so awaiting results to see if it needs to be tweaked to my taste. First time trying diy. Products were packaged really well and the instructions included made it so much easier that I was expecting. Flavours taste great. Would highly recommend.